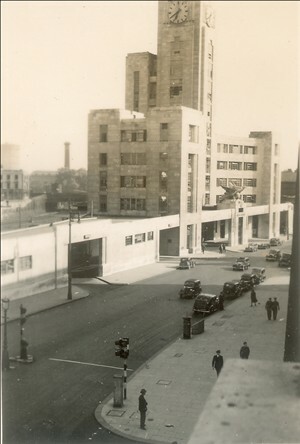 Opened as the Imperial Airways Empire Terminal in mid-1939, this was one of the world’s first purpose-built city centre air terminals where passengers could check in for their flights and then take rail transportation to Hythe, near Southampton, Imperial’s flying boat base or road transportation to Croydon airport for its land-based aircraft. Imperial was particularly proud of the rail link and announced that “Empire passengers will leave for Southampton (Water) by special train from the company’s private station in the rear of the premises.” The “premises” were designed by Albert Lakeman in “deco-baroque” style centred around a massive clock tower and a canopy topped by a sculpture entitled “Speed Wings Across the World”, emphasising the part that air transportation was playing in shrinking the globe in terms of travel time. Its opening received scant publicity although the Westminster and Pimlico News described the building’s 175ft tower as symbolising “the reaching out of this great organisation.” Of course, the looming war probably accounted for the lack of general interest in the terminal. After all, it could all be bombed to smithereens once the war started. Happily, it wasn’t and with the coming of peace it was ready to serve the public again from 1946 – although it must be added that the British Overseas Airways Corporation (BOAC), successor to Imperial Airways, had carried on during the war years transporting over 20,000 “priority” passengers on its often arduous transatlantic flights for example. This page was added by Adrian Autton on 19/07/2014.